Valentine’s Day has come and gone in my room, but it really was not a one day celebration. The last time I bought wine, I asked for two empty cardboard boxes with the wine bottle dividers still inside. Then my Americorps volunteer decorated them on the outside, and put sticker labels on each compartment with the children’s names. The writing center was then stocked with stickers, cards, markers, stamps, and word cards, and the kids got to work. 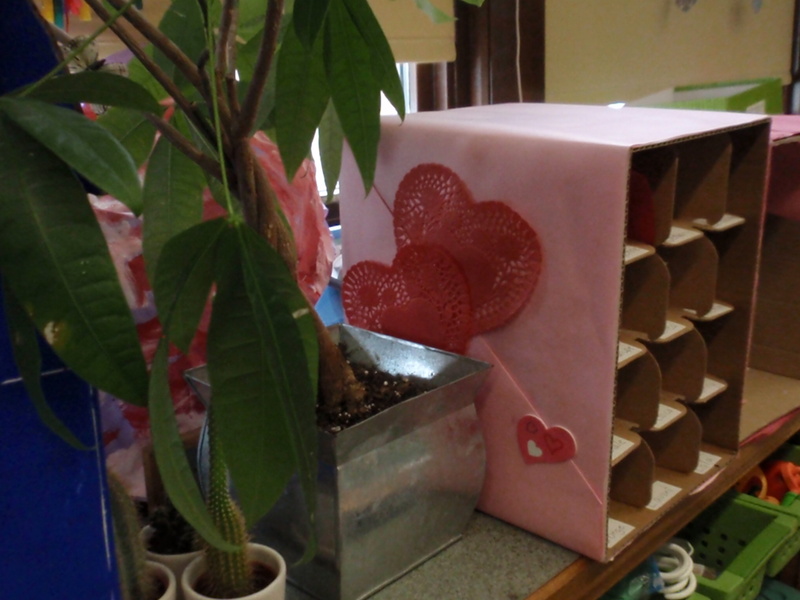 They made valentines for each other, and for the adults in the room, and then would go say to someone, “check your mailbox!” The best part was that the kid who received a valentine note would always say thank you to whoever made it. When I made valentines for the children, they would hug me. When they made valentines for me, they would hug me some more. The writing center can only fit four people at a time, so we had to turn the art center over to valentine-making, as well. So almost every day for the last two weeks, we had up to ten people at a time making valentines for their classmates and teachers. It was a love-fest, and I loved every minute of it. Plus, it seems like a great segue into writer’s workshop, which will start in the next week or two. If they didn’t before, everyone now knows they can write. what an awesome and fun idea! I was just commenting yesterday that these boring pre-made fold and stick valentines just don’t cut it. I remember spending WEEKS creating hand made glue-glitter-doily-construction paper original pieces of ART to give my friends and family. Today’s kids are missing out! I am glad your little ones had the chance to create and give homemade love! Maybe next year I’ll join you!